To be in love is a magical experience. The feeling of being in love with someone is priceless. It makes people expressive and kindles the desire to pour our heart out to that special person. Be it the fleeting minutes of romance that you had with your beloved or those special moments of emotional connect that you felt with your partner, every fond memory that you create goes on to last forever. Some will say it with flowers while others will bring on the bling. Others will get creative with customized dates while some will play it low-key with an at-home dinner date and together time. However I have always believed that this special day of love is not only a lover's day but my heart beats out for close friends and family too who have been understanding, loyal and supportive, every step of the way in my life. Lovely month of love calls for something extraordinary, something special. Every special celebration calls for a special treat. But in busy day to day life sometimes we don't have time to whip up a special meal. But trust me a simple dish made with love speaks love. 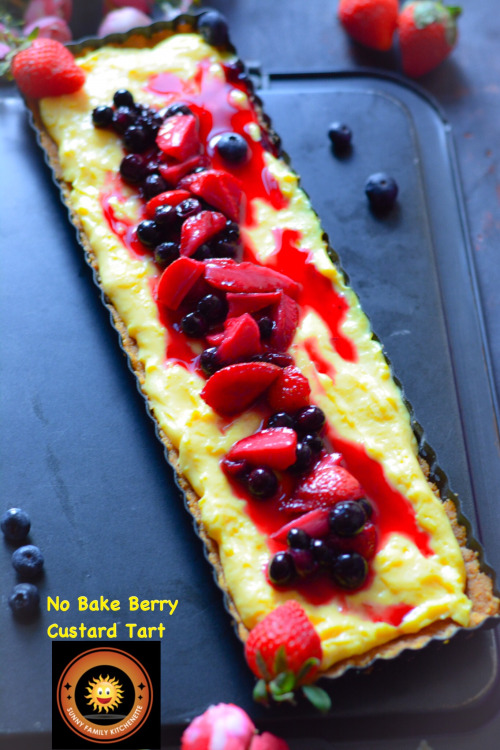 You can count on this easy peasy Tart for sure! This is super simple to make yet will bring a romantic feel to your valentine spread!! So dedicating this Lovely dish to my love of my life, my family and my friends. Keep spreading love and happiness!! We will start by making the Tart Shell. For that either crush the biscuits with the help of a rolling pin or you can crush them in your food processor too. Combine the crushed biscuits and melted butter. Make sure all the biscuits crumbs are evenly coated in butter. Press down the mixture in bottom and to the sides of the tart pan. (I have used a 13.5”x4” rectangular Tart Pan). Let it rest in the refrigerator for 40-50 minutes. Take 1/2 cup milk in a bowl. Add in the Custard Powder. 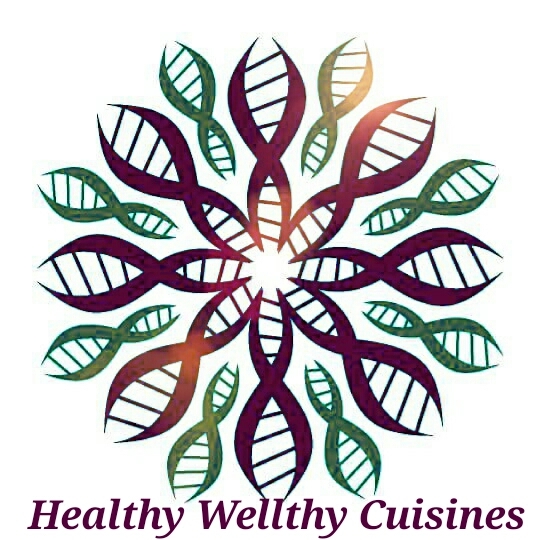 Mix well to smooth consistency. There should be no lumps. Meanwhile, in a pan put remaining milk and put it on low heat. Once it comes to a boil add the custard mix and sugar. Keep stirring the mixture until it comes to boil and thickens. Turn off the heat. Transfer the prepared custard in another bowl and let it cool down a bit. Once it comes to room temperature cover the bowl with cling wrap so that the cling film is touching the upper surface of the custard. This will prevent the formation of thick upper layer. Keep it in fridge for some time. Cook strawberries, blueberries and sugar in a saucepan on medium heat. Cook until the sugar melts completely and the mixture is of saucy consistency. Take out Tart and Custard from the fridge. Whisk the custard little bit. Pour it over the tart and keep in fridge to set. Just before serving pour the Berry Sauce Topping over the prepared Custard Tart. Enjoy the yummy treat with your loved ones!! 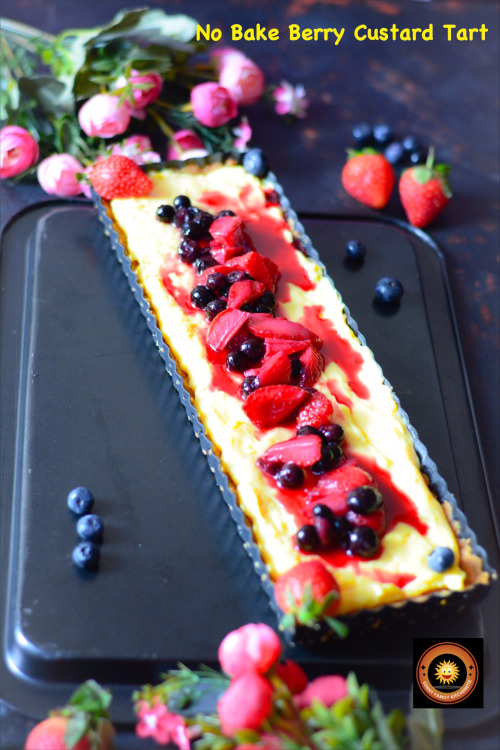 This recipe ‘No Bake Berry Custard Tart’ is my contribution to the FB group Healthy Wellthy Cuisine where we are celebrating Valentine's Day Recipes!! 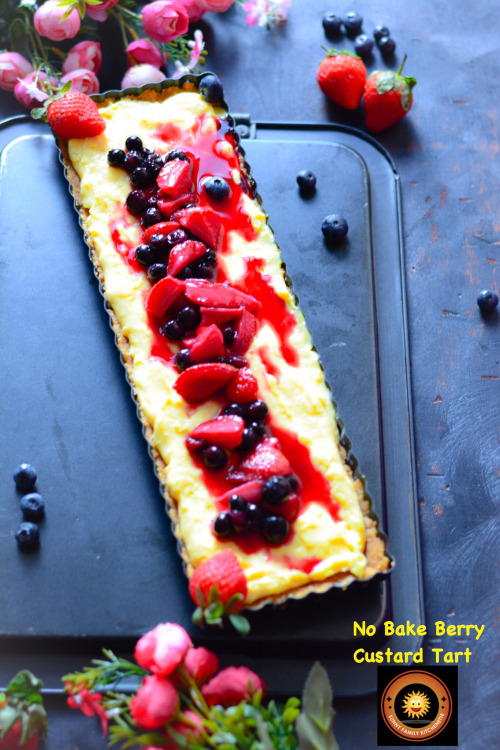 Beautiful idea to use custard in a tart! Looks so scrumptious and delicious! 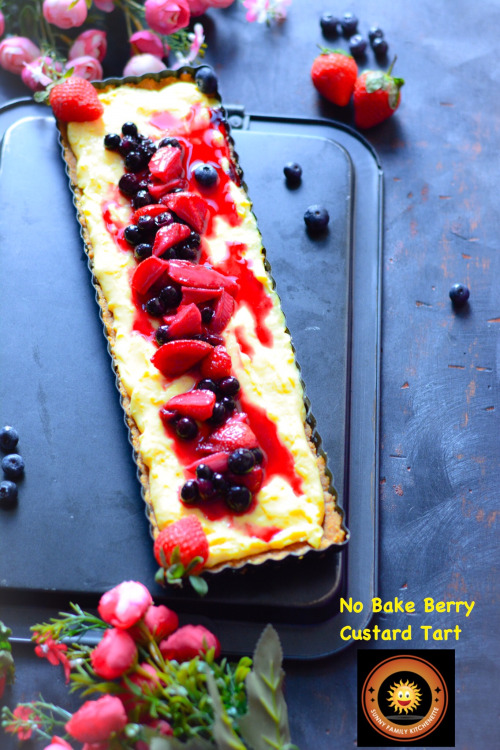 No bake too! Loving it dear <3 The combo of biscuit crust and creamy custard is to die for! Fabulous.. fabulous.. fabulous! It looks so good and yummy! Feeling like grabing some from the screen. Awesome share for the season and theme as well. The tart looks super tempting . Lovely clicks as well . Live the presentation ! 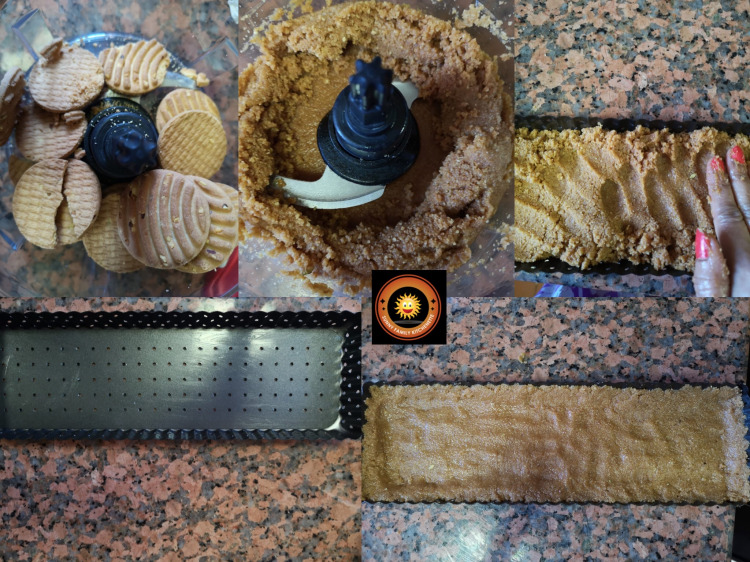 Loved the recipe of Custard tart.. and i like your tart mould too! 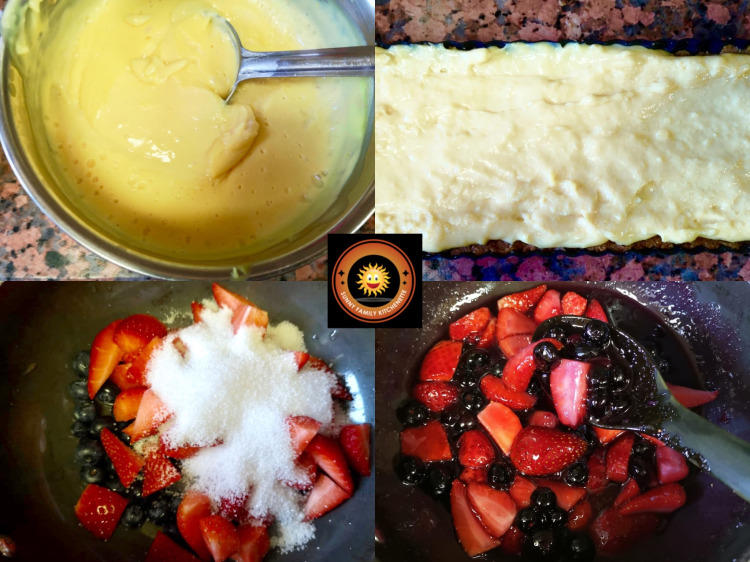 !Fruit Custard is me and my hubby's favourite, having as tart makes it more delectable!! Lovely capture!! Wah wah !!! i was also thinking to make a tart kinda post. 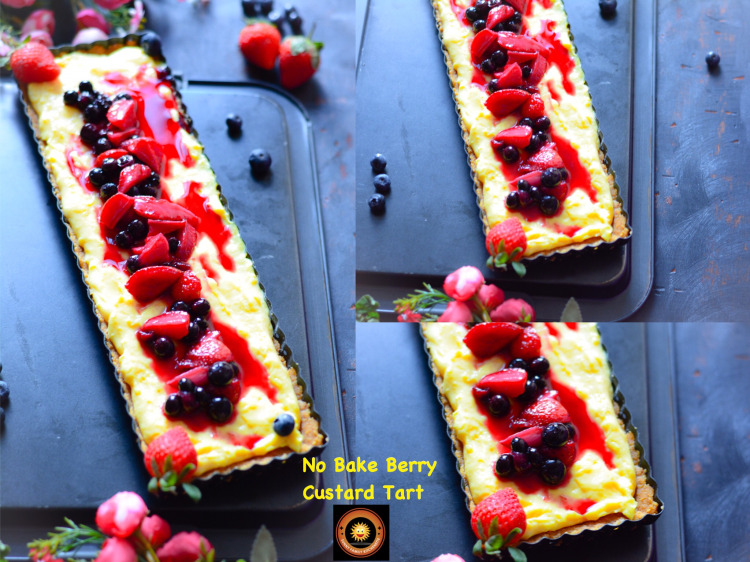 But due to unwell, I couldnt get much time, so ended with a beverage :) The custard tart using berries is looking awesome for a romantic treat !